Munich - The Oktoberfest beer festival gets under way this weekend, with millions of people from all over the world, including plenty of football fans, set to converge on Munich to take part in the festivities. The majority of the six million visitors who flock to the Theresienwiese during the 16-day festival associate the Oktoberfest with beer, Lederhosen and oompah music in particular, but they may not be aware of the origins of what is now the world’s largest fair. The Oktoberfest began as nothing more than a wedding reception - albeit one of royal proportions: Prince Ludwig married Princess Therese of Saxony-Hildburghausen on 12 October 1810 and Ludwig invited the citizens of the Bavarian capital to attend the celebration, which was held on the fields in front of the city gates - now known as the Theresienwiese - in honour of the Princess. The festivities culminated in a series of horse races which were repeated the following year, giving rise to the tradition of the Oktoberfest. Many shows and amusements were added during subsequent years, with the first beer tents set up for the 1896 edition of the festival. Nowadays, six million people visit the Oktoberfest and, needless to say, get through copious amounts of beer, with 3.6 million litres served during the first week of the 2012 festival alone. Every year, the mayor of Munich gets proceedings under way by tapping the first keg of beer with a cry of "O'zapft is'! ", meaning "the beer is tapped!". 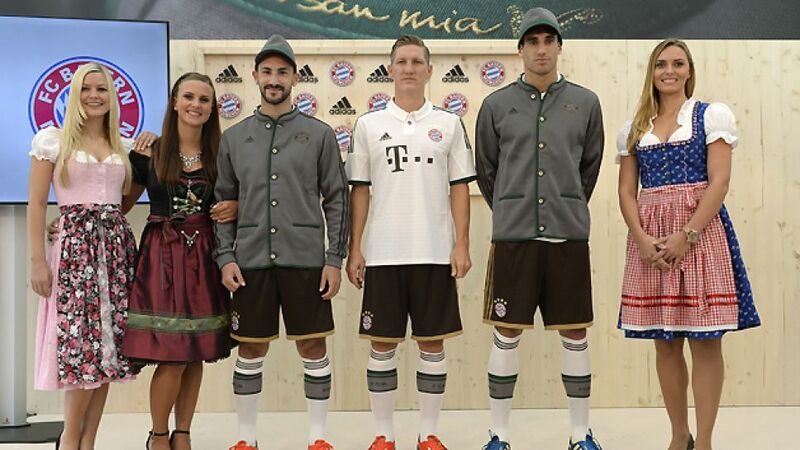 Countless celebrities attend the Oktoberfest every year, including the players of FC Bayern München. Whether homegrown talents such as Bastian Schweinsteiger, Philipp Lahm and Manuel Neuer, or foreign stars like Arjen Robben and Franck Ribery, they will all be donning the traditional Lederhosen for the occasion. The European Champions have already introduced a new Oktoberfest-inspired jersey, which they wore for the first time in Matchday 5’s victory over Hannover 96 and will wear for the duration of the event. Bayern are due to visit the Theresienwiese after their home match against VfL Wolfsburg at the Allianz Arena on 28 September. The Wolves were the last team to play the Bavarians during the Oktoberfest. On that occasion, they were comfortably beaten 3-0. However, Bayern’s overall Oktoberfest home record isn’t quite as impressive as their ‘usual’ home form. They have won 64% of their matches on home soil during the “Wies’n”, but have won almost three quarters of their home matches outside the Oktoberfest period. A total of 4,678,000 million fans have attended Bayern’s 80 home matches during the festivities down the years, which is an average of 58,475 fans per game. That may not sound like much - considering the current capacity of the Allianz Arena is 71,000 - but when one bears in mind that Bayern’s overall average home attendance is 43,450, you can see how popular the event is among fans. Pep Guardiola’s side will be hoping to give their own fans reason to celebrate the next time they take to the Allianz Arena pitch on Matchday 7 - before heading off to celebrate themselves.